I went to a wedding a few years ago and was chatting to a girl I kind of knew from Uni. She explained that she now worked in finance – fund management to be exact. Coincidentally she had come across my Mum – my mum is a journalist who writes about finance. This girl had approached me to tell me what a legend my mum is. She described her as a role model for all the women in the industry. If I am honest I was a little stumped. My mum is just, you know, my mum. But my mum started working, continued working and has a successful career in journalism since the early 70s. My mum gave me some really useful advice before I went into my fellowship interview 3 years ago. She told me to “think like a man”. Initially I was rather surprised. Surely this is sexist! By thinking like a man we acknowledge a perceived difference. That somehow men are more likely to get these kinds of grants than women in 2018!? That men feel more sure of themselves. But it really did help. I recall waiting to go into my fellowship interview with four men- all looking super clever in their business suits. I decided that the other people in that waiting room looked like they knew what they were doing, like they had it all together, like they were winners. I couldn’t decide whether to keep my cardigan on or off. What would make a better impression? Yet no one else in the room seemed to be worrying about anything (on the outside). Consequently I remember thinking oh well- I’ll just go in and go for it. I pretended to feel like the men in the waiting room looked. Perhaps simply encouraging me to pretend that I was someone else who knew what they were talking about (no matter what the gender) was the most useful part of my mum’s advice. In general being a women has never held me back. I am a female with two sisters. I went to a girls school. Then speech and language therapy; a predominantly female profession. Perhaps this journey has actually given me an advantage. Having children and taking maternity leave is usual. Part time job roles are common. People often split posts – even managerial posts. I feel that the profession is well equipped for families- it is easy to continue developing a career and being an active parent (my sisters in law and finance have had to struggle somewhat more with this balance). Before I went into research my colleagues suggested that this career trajectory wouldn’t be any where near as accommodating for these needs as working as an SLT. People did and still do say that doing research or further study whilst having children must be far too difficult to juggle. I have actually found the opposite. Doing this has worked extremely well for my family. Research is much more flexible- I can go to school assemblies, take my children to medical appointments and host play dates without taking any additional time off work. In fact none. I tweak my hours to suit my needs- I work in the evenings, in the car while they do their various extra curricular activities and occasionally at weekends if I want to. 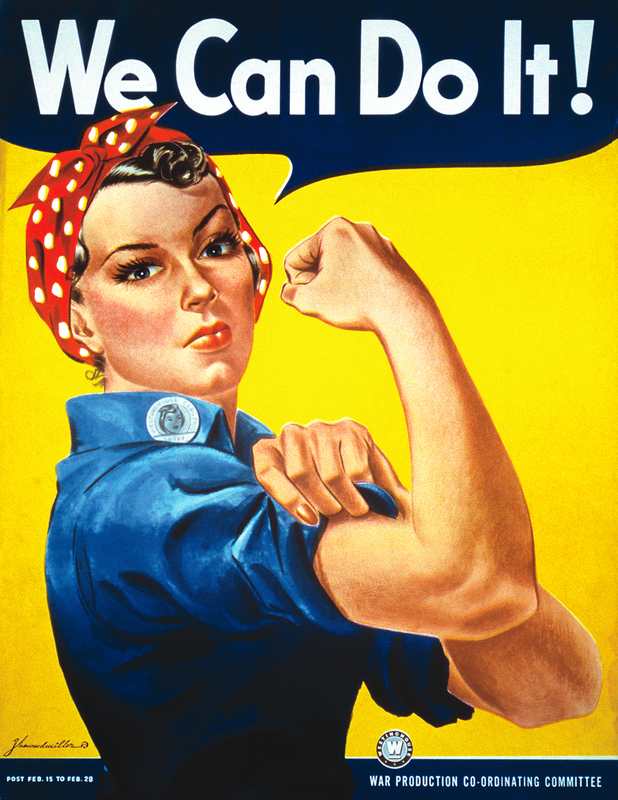 And there are some wonderful female role models in my profession and more generally at UCL. Not least my very own supervisors- both very successful female researchers at UCL. The head of my department- a female. The women who built the building I study in- a female. The building itself having been named after two sisters who invested in the first women’s medical college which is what the building then hosted. I feel ever so lucky, if I need to I now pretend to feel like they all look- strong and confident and clever. I try to think about what my supervisor would say or do in this situation. I try to think about the phrase that my head of department would use. I try to harness the drive that those first female medical students would have had. All these wonderful females to aspire to on my research journey. I started my undergraduate Human Communication Sciences degree at UCL to become a speech and language therapist 20 years ago this September. When I tell people this they often ask “So, why did you choose speech and language therapy?” I sometimes give an emotional answer about helping people, and occasionally mention my cousin (who had started training to become a speech and language therapist but sadly withdrew from the course as she was diagnosed with a life limiting illness). If I am completely honest my mum told me to do the course. I think she thought it I would like it, and as a rather immature 17 year old I was surprisingly also very compliant. Thank goodness she directed me down this path. Having made this decision I went straight from my A-levels to university. On graduating (four years later age 21 and still rather young) I recall a sense of overwhelming relief at finally leaving education- oh to be free at last! Free to be a real grown up with no homework and no guilt about needing to do homework ever! One of my peers on the course was considering doing a PhD – she hadn’t enjoyed her clinical placements but was academically a pretty high achiever. I somehow decided that this was the type of person best suited to academia. In my mind academics didn’t need social skills, but required incredibly high intellectual skills. I didn’t classify myself as possessing any of these per-requisite skills thus I felt I wouldn’t ever be appropriate for this high flying career pathway. Another decade and a half later and I realise what my 21 year old self didn’t. Being an academic is just not that simple. They are stubborn, social and curious and I probably maybe do identify with that species. I am stubborn as hell, I like to do things – right through to the end. Anyone who knows me can vouch that I am a bit of a chatterbox and a giant nosy parker. This definition also describes the qualities of many clinical speech and language therapists and as a clinical speech and language therapist I really feel there are so many transferable skills that can help you down the academic career pathway. Speech and language therapists are often pretty good at starting conversations, listening, probing, clarifying, exploring and building social relationships. These skills allow them to build rapport with clients, generate discourse and explore communication skills before setting goals to work on in therapy. Similarly academics use these skills to build rapport, find common interests, shared goals and making connections and networks to disseminate work and build future research opportunities. Networks are one of the most useful arsenals in an academics weaponry. Being able to connect with others – potential participants, potential collaborators, potential presenters, potential mentors, potential supervisors, potential employers, potential funders, potential research sites – is a key skill. This can assist you in finding inspiration, developing ideas for a research project, getting advice and support, finding people to champion you, supervise you, fund you, employ you, encourage you, do research with you and for you, publish what you research, invite you to present your work and disseminate it to develop your career. You can always learn how to write properly – its getting the infrastructure in place for the research journey that is key. I feel strongly that there are many clinical speech and language therapists who don’t realise what wonderful qualities they have and who could thrive and succeed as clinical academics. There is little to demystify some of the ideas around what an academic should look like and to become one in our profession. Open conversations on this topic could really benefit our profession. Katherine Broomfield started one of these conversations earlier this year on twitter that really evolved into a twitter-storm. The conversation highlighted that many academic speech and language therapists felt the same. Consequently Dr Abi Roper set up at twitter account to continue the discussion @ClinAcSLTs. This also led to a meeting at the Royal College of Speech and Language Therapy (RCLST) where we discussed the barriers and issues speech and language therapists face in embarking on a clinical academic career. Katherine’s blog outlines some of the plans we made to collate and bring our experiences together in order to bridge this gap. Clinical academics in action! 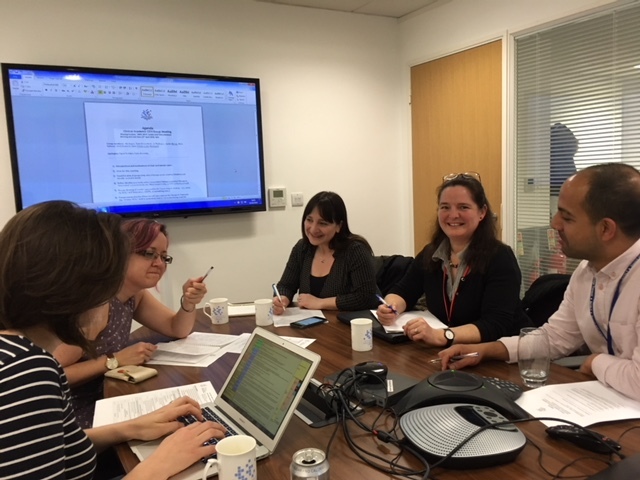 From left to right Dr Lotte Meteyard, Dr Abi Roper, Dr Jackie McRae, Jo Wallinger, Amit Kulkarni, and I am taking the photo (Katherine Broomfield is represented by the teleconference equipment in the centre). We discussed existing resources such as the RCSLT Research Champions Network and ResNetSLT. We plan to link in with both and will be presenting at the forthcoming RCSLT Research Champions meeting in July. Dr Hazel Roddam from ResNetSLT is keen to work alongside us and has been a part of all our discussions. We have plans to continue blogging and spreading the word. Ultimately we hope to hold regular meetings for both clinicians and academics to come together to share their experiences. Debunking some of the myths could be a great starting point. For example: You really don’t need to be that clever to be a clinical academic. In fact, many of our clinical skills as speech and language therapists are great assets for academia. Information session for SLTs and AHPs who are committed to clinical research as part of their career and are considering further study at doctoral level (PhD) or who already have/are completing a PhD and are considering postdoctoral research opportunities. Insider information on the NIHR schemes and other funding sources. Hints, tips and the realities of applying for funding: an opportunity to hear from SLTs who are currently or have been funded by the NIHR to complete a PhD, and with SLTs who have other PhD funding. Q&A session: get answers to your questions and practical advice from a panel of PhD students and staff. Plus an opportunity to informally network with SLTs who are doing or have recently been awarded a PhD, and with staff with a range of research interests.